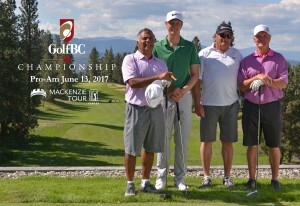 KELOWNA — Adam Cornelson knew his life had changed when he arrived for Tuesday’s GolfBC Championship pro-am at Gallagher’s Canyon Golf & Country Club and was told his group was going off the first tee in the afternoon shotgun start. “I always had to walk out to the 16th hole before,” Cornelson said with a smile. 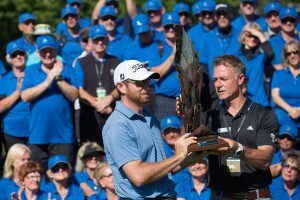 The 28-year-old Langley native has been wearing that smile since late Sunday afternoon when he won his first Mackenzie Tour-PGA Tour Canada event, going wire to wire at the Bayview Place Island Savings Open in Victoria. He hasn’t stopped shaking hands since. Everyone, it seems, wants to congratulate Cornelson. Cornelson is one of the Mackenzie Tour’s most popular players and had to weather some tough times before breaking through with his win on Sunday. Just last month, he was back at the Mackenzie Tour qualifying school at Crown Isle in Courtenay fighting to re-earn his playing card after a sub-par 2015 season. He survived Q school and in his 52nd start on the Mackenzie Tour broke through with his first win on Sunday. His fellow competitors were delighted for Cornelson. The group of B.C. regulars on the Mackenzie Tour is a tight bunch and root hard for one another. “I have seen first-hand how hard he works and I have also seen the disappointments that have plagued him over the years,” said Vancouver pro Ryan Williams. “He’s had some close calls. I saw him have to go back to Q school and regain his card, which isn’t an easy thing to do no matter who you are. So to see him get a W last week — and especially the way he did it leading wire to wire in a dominating fashion — you could definitely tell he was ready for that moment and he seized it. Cornelson acknowledged that some of his past struggles made the win that much sweeter. The win was worth $31,500 to Cornelson, but it could be worth a whole lot more than that if he can parlay it into a promotion to the Web.com Tour at season’s end. The top five money-winners on the Mackenzie Tour at the end of the 11-event season earn some status on the 2016 Web.com Tour. 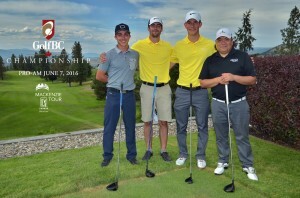 Cornelson enters the GolfBC Championship second on the money list. Cornelson, who played in Tuesday’s pro-am with GolfBC boss Caleb Chan, said he and the other players are excited about having a new event in Kelowna.